"I'd been in magazine journalism for more than 20 years," Chidley said. He hadn't actively been looking to change jobs, but the offer from Veritas came at a time when "I had been thinking about what I was going to do after journalism for a while." After nine years as CB editor, Chidley was appointed editor and associate publisher, special projects at Maclean's and Canadian Business last July. With Veritas, Chidley will now work with clients such as the Ontario Ministry of Energy and Infrastructure, Genworth Financial and Plan Canada as well as overseeing media training services and crisis management for the agency. The executive director of the British Columbia Magazine Publishers Association (BCAMP) says she wishes the federal government, and specifically the Department of Canadian Heritage, had not wholly ignored every recommendation from the industry in rolling out its new Canada Periodical Fund. "I'm hoping the B.C. government comes to its senses and puts some funds into B.C. arts' pockets," Rhona MacInnes told the Vancouver Courier. In particular, she said that putting a floor on federal funding of magazines with less than 5,000 copies per year paid circulation could change the BC publishing landscape. "In a year we'll see if we have anything left." The Courier article pointed to one bright spot -- funding for Vancouver magazines from the city. Margeret Specht, director of the grants, awards and support program for the city's office of cultural affairs, said the city opened up cultural grants to Vancouver publications for 2009. The program gives out grants, ranging from $2,000 to $130,000, to arts and culture organizations in the city annually. Only two publications secured funding through the program in 2009--literary magazine sub-TERRAIN, which received $7,000, and Vancouver Review, which received $12,000. Applications from publications doubled this year, but Specht couldn't give specifics since the recommendations for application approval have yet to come before council. We note that Redwood Custom Communications, Canada'a largest provider of contract-published or custom magazines and media (now a subsidiary of Transcontinental Media) has announced its new name: Totem. The associated tag line is "Brand Stories". Schneider said the rather enigmatic tagline "Brand Stories" reflects what the company's staff does. Transcontinental Media has named Erin McLaughlin as the Editor-in-Chief of Style at Home magazine. She will retain the EIC title for Canadian Gardening. This is not the first time Transcon has made one editor responsible for two major national titles. McLaughlin herself was EIC of Canadian Home and Country and Canadian Gardening in late 2008. And in 2003, Charlotte Empey, then EIC of Canadian Living was named EIC of Homemakers magazine and group publisher of both titles. Mclaughlin started as a staff writer for TV Guide, moved to feature editing and deputy editing stints at Canadian House & Home and Redwood C.C.’s Real You magazine and, as editor, relaunched Century Home magazine as Canadian Home & Country. CH&C was surprisingly folded and in 2008 was named editor-in-chief of Canadian Gardening magazine, a position she will continue to hold as she expands her responsibilities to include Style at Home. The need for a new editor arose when Jane Francisco leaped over to Rogers' Chatelaine magazine after only a few months in the Style at Home chair. She had previously been the editor of St. Joseph's Wish magazine, which was closed in November 2008. "The Driver’s goal is to become a Canadian authority in the car and driver industry,” explains the publication’s founder and publisher Sam Adewale. “We’re gearing ourselves to providing our devoted readers with relevant stories that they care about and that affect and shape their daily lives." The newsstand push of the formerly controlled circulation title is being done through Disticor. The Driver has already signed renowned race car driver Alex Tagliani of the FAZZT Race Team as a regular contributor. The article suggests that some publishers see the new technology as a way of undoing mistakes of the past -- such as giving away content that they should have charged for. Customers' willingness to spend money on and through mobile devices holds out hope for a major revenue stream. Of course publishers have the unhappy example of the music industry, too, which, in its rush to sign up with the iPod managed to give away direct control of their audiences to Apple. The CEO and publisher of the Women's Post magazine has announced what can only be called a wild card candidacy to become mayor of Toronto. Sarah Thomson announced Tuesday that she is quitting to jump into the race to succeed current Mayor David Miller, who is not seeking a third term. Thomson has virtually no elected political experience, save having run unsuccessfully for a council seat in Hamilton at one point. "We can watch as the spirit of innovation gets stifled by our politicians. We can watch businesses relocate to other cities, taking our jobs with them. We can watch the slow construction of light rail lines hurt our local businesses and waste millions of our tax dollars. Or we can unlock a different future — a future of opportunity," she said. Thomson will be up against former deputy premier George Smitherman, deputy mayor Joe Pantalone, former Liberal party director Rocco Rossi and councillor Giorgio Mammoliti, with TTC chair Adam Giambrone is widely expected to enter the race on Feb. 1. A self-made business woman with her own "bootstraps" story, Thomson struck out on her own at fifteen, staying afloat by couch surfing and occasionally sleeping outside. After working as a gas station attendant she franchised a station at seventeen, was operating four stations by the time she was twenty-four, and started a home renovation business on the side. Meanwhile, she completed a philosophy B.A. at McMaster as a part-time student. Years later, Thomson ran for city council in Hamilton, narrowly losing to the incumbent. She also founded the Hamilton Examiner, later selling it to start Women’s Post, the women’s business magazine that she has been publishing for the past eight years. But Torontoist also noted acidly that a post on her blog "How to Run for Mayor of Toronto" made her campaign sound more like a school project. It's easy to see why she's a hit in the business world. In person, she is peppy, direct and brimming with confidence. She says her experience of making a payroll would help her fix Toronto's budget mess. Business owners "understand what it means to be fiscally responsible." She says her 20 plus years of managing people would help her get the city's feuding councillors working together. Under Mayor David Miller, "They haven't had a strong leader who can unite them in a solid strategy." That leader, she says, is her. If all you need to be mayor is enthusiasm and a business résumé, Sarah Thomson is a shoo-in. One thing I’ve learned here is that, despite the various narcotics of the web and text messaging and BlackBerries and iPhones, you can still get students to read long pieces—especially if some of those pieces are undeniably compelling. You can get them to think. You can get them to understand that it’s important to step back and wonder at the world, to question what’s happening in the world, to slow down briefly and pause to consider what this mutant rat race is all about. -- Bill Reynolds, the head of the magazine stream at Ryerson University, in his excellent article about the unconventional course Journalism and Ideas, which requires second year students to read and discuss two pieces of long-form journalism, mostly long magazine pieces, a week. Originally published in the newsletter of the International Association for Literary Journalism Studies 3:2 (Spring 2009): 18 and reprinted by J-Source.ca. "If you think about journalism, not business models, you can become rather excited about the future. If you only think about business models you can scare yourself into total paralysis." -- Guardian editor Alan Rusbridger, speaking in the Cudlipp Lecture about the controversy over paywalls, which he said could see the business "sleepwalking into oblivion". The full text of the lecture can be read here. And a video interview is available here. McNally Robinson Booksellers, one of Canada's largest magazine and book stores, has emerged from bankrupty protection with two stores instead of four and chastened by business decisions that nearly put them over the edge. The company's bookstores in Saskatoon and Winnipeg's Grant Park shopping centre are open for business and continue to employ about 250 people. Owner Paul McNally said in a story on CBC.ca that the court supervision and reorganization was "punishing and very emotional"
"It involved terminating a lot of employees and as you surely know, is deeply emotional and painful. A lot of money was lost." The company, which was founded in Winnipeg in 1981, had to let go 175 people and close a Winnipeg store at the Polo Park shopping centre and one in Toronto at the Shops at Don Mills, which only opened last April. "It was clear from the opening sales at Don Mills that we had entered into a death spiral." said McNally, acknowledging it was a big mistake; it was opened in the wrong location and the wrong time and ended up being one of the biggest reasons the company suffered such significant losses -- more than $2 million in the 2009 financial year. 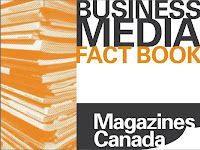 With its growing focus on the business-to-business sector, Magazines Canada has just published its downloadable Business Media Fact Book, a companion to a similar guide to consumer magazines. As with the consumer book, it is an ad sales tool helping sales professionals make the case for business media as part of an advertising sales mix. "The Fact Book is a 61-page compendium of industry trends and the latest and greatest industry research providing a gold mine of useful, most requested facts for media planners, advertisers and magazine sales professionals," says the association. "The Business Media Fact Book, in a simple, factual way, demonstrates how B2B media platforms get noticed, generate leads, initiate consideration, assist negotiation and, ultimately, make business happen!" Magazines Canada recently began accepting b2b publishers as full members of the association and has entered into collaboration with the Canadian Business Press to operate Magnet, the annual industry conference held each June in Toronto. [This post has been updated] Quad/Graphics Inc, has agreed to buy magazine printer Worldcolor Press Inc. of Canada, which prints magazines such as Time and Cosmopolitan.The sale price is about $1.3 billion. According to a story published on Bloomberg.com, the merged company, which will be publicly traded, will have 30,000 employees and combined sales of $5.1 billion. Joel Quadracci, Quad/Graphics’s chief executive officer, will lead the new company as chairman, president and CEO, the company said. 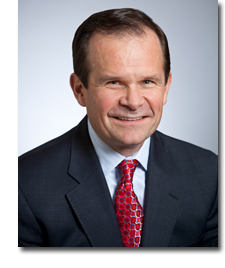 “We will enhance our leadership position in the printing industry,” Quadracci said in the statement. Shareholders of Worldcolor, which is based in Montreal (and until recently was called Quebecor World), will own about 40 percent of the combined company, the statement said. The Quadracci family will control the company through ownership of its Class B shares. Quad/Graphics will distribute $140 million in cash to its shareholders, the company said. Quad/Graphics has $1.2 billion of financing from JPMorgan Chase & Co. and U.S. Bancorp to fund the acquisition and cash distributions and to refinance borrowings, the company said. For publishers and editors who are interested in developments and trends in podcasting (both audio and video) as an adjunct to or line extension of print publishing, you may be interested in a 90-minute webinar that is being offered this Thursday January 28 by Tom Webster of Edison Research. His company recently completed a study of the attitudes of active podcast consumers. The webinar, which runs from 3 p.m. to 4:30 pm EST is free (but you must sign up). It will probably be archived by the Association for Downloadable Media if you can't watch it on Thursday or can't spare the time. It fact you might want to look at an earlier podcast about consumer trends in podcasting, which shows the growth of interest in this form and talks about the ways in which ad-wary podcast users can be appealed to. By the way, Magazines Canada is actively working on plans to offer some of its professional development program online by use of webinars or similar. It's one of the ways that a far-flung membership can be served cost-effectively across time zones. The Periodical Marketers of Canada are undertaking a three-month study to see whether Canadian magazine titles sell better when grouped together on the newsstand or displayed mixed in with other (largely U.S.) magazines according to different categories. A story in Mastheadonline says 70 Canadian titles will be displayed in a dedicated space at three International News location in downtown Toronto. The sales results will then be compared with sales from the equivalent period the year before. The results will be released by the end of May. Entries for the Atlantic Journalism Awards (AJA) are due by Friday, January 29. Entry forms and category descriptions are available at the website. Awards are presented at a gala dinner in Halifax, May 8. The awards have this year added three magazine categories -- best magazine article, profile article and best magazine cover -- to its awards lineup. Type designers, graphic designers and other artists from around the world are invited to contribute artwork to be included in a typeface created exclusively for the Font Aid IV effort. The theme of Font Aid IV is "Coming Together" which will represented though a font consisting entirely of ampersands. Unfortunately, the deadline to submit a black-and-white "ampersand" icon (vector image, not bitmap, send in EPS format) to the competition is only 3 days away, January 29. Media entrepreneur Moses Znaimer has acquired a tighter grip on control of ZoomerMediaLimited, of which he is President and CEO by selling it several media and real estate assets he controls, in return for shares in the company and $4 million in cash. Znaimer and his holding firm Olympus Management Limited thereby have acquired 66% of the common shares and 66% of the preferred shares of ZoomerMedia which, among other things, published Zoomer magazine. The purchase of the Znaimer assets was financed by a recent $17.6 million private placement in Zoomer by Fairfax Financial Holdings Limited. The acquisition price for the MZ Assets will be paid through the issuance to Moses Znaimer and Olympus Management Limited ("OML"), a company controlled by Moses Znaimer, of 4,094,970 common shares of Zoomer and 255,905,030 non-voting Series 2 Class A Preference Shares (the "Series 2 Shares"), all issued at a price of $0.10 per share and $4 million in cash. At the time of closing, OML intends to invest a further $2 million in Zoomer through the exercise of warrants for cash to acquire a further 20 million common shares of Zoomer at a price of $0.10 per share. Zoomer will also assume mortgage liabilities with respect to the Property in the principal amount of approximately $10.2 million. Zoomer magazine has a paid circulation of about 180,000 and is estimated to sell about 12,000 copies on newsstands. Zoomer also controls CARP, Canada's largest association for the 45 plus and its online properties, with approximately 350,000 members. One of its largest properties is 50plus.com, an interlinked series of websites that target the 45+ age group. ZoomerMedia publishes Zoomer magazine, associated websites and other media properties, largely in radio. Recently, the company announced the acquisition of the assets of Vision TV. Today marks the first anniversary of the lockout of the Journal de Montreal workers by the paper's owners, Quebecor Media. The staff is marking the occasion with the $20-a-ticket "solidarity benefit concert". If history is any indicator, this lockout may continue even longer; its predecessor at the Journal de Quebec lasted 16 months. 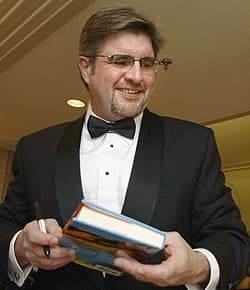 There's a great sense of loss in Canadian arts and letters about the death early this morning of Paul Quarrington, who died of lung cancer at the age of 56. Quarrington was a man of many talents, starting off studying film then gaining attention in music, moving on to writing and novels and winning three National Magazine Awards as well as the 1989 Governor General's Award for his novel Whale Music and the Stephen Leacock Award for Humour in 1988 for his novel King Leary.His work rattled back and forth between music-making and writing for his whole, too-short life. For his magazine writing, he won or shared in four golds and a silver award and was nominated 15 times between 1999 and 2007. The list can be found here. "It’s really hard to be a traditional media company and say you’re going to be a scale leader when you’re competing with the likes of Glam and Yahoo. You have to pick a different path. The path we’ve picked is high quality, branded content in affinity groups that pertain to our subject areas of expertise: Fitness, parenting, home, food. And we invest in the content creation and delivery and that’s both text and video, and in aligning our Web properties with our offline brands." -- Meredith National Media Group president Jack Griffin, speaking in a Q & A with Folio: magazine, explaining why online display advertising will be "no one's salvation". His group's profit jumped nearly 40% in the second quarter. What is a more effective security strategy: ensuring that people with grievances feel so repressed, demonized and shut out of the legitimate processes of accountability that they are not able to speak up in public? Or providing venues for people to raise concerns, encouraging the public to participate in debate on controversial ideas, and for all of us to be able to have a public discussion about whether or not these Olympics are a good thing after all? Free speech is our guarantee of security. Repression will only guarantee instability. The whole speech can be read on Eby's blog. Vice magazine, which was born in 1994 as a Montreal zine and grew to become a multinational publishing and online phenomenon, has signed an agreement with the cable news network CNN to share content. According to a story in Marketing magazine, the first of what will be weekly updates was put up on the CNN.com/VBS website. Vice is now based in New York and had previously made partnerships with MTV and IFC. "Most people reading this press release will think, ‘Vice and CNN, hmmm. That's an odd pair of bedfellows for you,' " said [company founder Shane]Smith, in a statement. "And you'd be right, the ‘Hipsters Bible' hooking up with the world's global news voice is a bit odd. But when we found ourselves evolving as a company and covering news stories around the world, there was truly no other option for a partner. CNN was our first and only choice. In a world of hyper-partisan op-ed ‘news,' CNN is the only one left with both credibility and reach." MastheadOnline has compiled a good and interesting rundown of the winners and losers (actual and potential) under the rules for the new Canada Periodical Fund, finally announced this week. "Though Google is driving some traffic to newspapers, it's also taking a significant share away," [ [Outsell analyst Ken] Doctor said. "A full 44 percent of visitors to Google News scan headlines without accessing newspapers' individual sites." Quote, unquote: Are we building a culture or what? "We can’t get this halfway right or three-quarters of the way right. We have to get this really, really right." -- Arthur Sulzberger Jr., the publisher of the New York Times, on the announcement that the paper will charge for online access to its content starting in 2011. After accessing a certain number of articles free, readers will be asked to pay a flat acess fee. No price was announced. Magazines Canada welcomes the new Canada Periodical Fund (CPF). The CPF is an important cultural program designed to help Canadian content reach Canadians. It replaces both the Publications Assistance Program (PAP) and the Canada Magazine Fund (CMF),both of which served cultural policy well over many years. We are grateful for the support of Heritage Minister Moore in sustaining full program funding including the annual $15 million that was once the responsibility of Canada Post in PAP.This first year of the CPF is a transition year through which Magazines Canada will work with Canadian Heritage to address the specific needs of the industry. The rules for the new Canada Periodical Fund (CPF) -- promised since last February, but only released late Tuesday -- are what many magazines had feared. Essentially, the Department of Canadian Heritage has not budged from the draft positions it first revealed a year ago (with a couple of notable exceptions, see below). Distribution of about $75.5 million in funding is to be based on the number of eligible copies distributed in a year, not mailing costs, as it was in the the former publications assistance program (PAP), and not editorial expenses, as it was in the Canada Magazine Fund (CMF), both of which are subsumed into the new CPF. About 95% of funding will be in the "Aid to Publishers" category. Despite the very late publication of the rules and release of the application, the deadline is one month from today, Monday, February 19, 2010. Payments under the program will be made direct to publishers, rather than through a Canada Post account and publishers are free to use alternative distribution. The rules are undoubtedly going to be a major disappointment to the many groups who lobbied hard to have the draft changed, including Magazines Canada and the Canadian Business Press and the ad hoc group of small literary and cultural magazines that mounted a concerted Facebook campaign to get the floor on funding lowered or eliminated. Applications under the new rules for current recipients of CMF and/or PAP funding will be subject to a streamlined "one-time-only" process (involving a simple, two-page application using data already filed with Heritage). They will receive an amount between 90% and 150% of their total funding from the SEC in 2008‑2009, the SALM in 2008‑2009, and the PAP in 2008‑2009, up to a maximum of $1.5 million (unless you are a farm publication). We are closing now while we can do so in an orderly fashion and not under any pressure from banks or suppliers. Duthies went through a radical restructuring 10 years ago and frankly, we do not want to go through that again. "I'm just not making it, so I'm going to close it down," said Duthie Legate. "We are going to start our regular sale January 28, but it will be better, of course, with discounts of 40, 60 then 80 percent and I hope to have all the books out of here by the end of February." "The last two years have been brutal," she said. "When the dollar went par that hurt and then last year hurt. Most of the year we run in the red and at Christmas we run in the black," she said. And this year my black wasn't as black as it should have been." The recession and big box and online competition from the likes of Chapters and Amazon have had a devastating effect on independents, on which many independent magazines rely for newsstand sales. Pages praised for being "hyper-local" and "human scale"
Permission-based list rental prices declined by almost 10% (9.84%) last year, according to a report in Audience Development, quoting an index published by Worldata. The business-to-consumer category was $100 per thousand, down 10.7% year over year. Business-to-business lists were going for $284 per thousand, down less than 1%. The only category of rental lists that saw a slight price increase was international e-mail addresses. More magazine, published for women over 40, which was launched in the U.S. in 1998 and later licensed in both French and English in Canada with Transcontinental Media, now has a southeast Asian cousin; Meredith Corporation has announced it is launching an Indonesian edition. A licensing agreement has been struck with Kompas-Gramedia Group (KGG) to begin distributing More Indonesia starting July 2010. It is therefore the third license for the More brand and, as it did in Canada, made a deal with the owner of some of the largest printing plants in the country. KGG publishes a national newspaper called Kompas and 12 regional newspapers, operates a chain of bookshops and has interests in book publishing, radio and television. It publishes 30 magazines, of which 13 are licensed, including National Geographic, TopGear, Autobild, Jip and Disney Junior. According to a company release, it will be published in Bahasa, the local language, and initially distributed throughout Indonesia’s major cities. Indonesia has the world’s fourth-largest population. Meredith has been actively seeking partnerships and licensing arrangements around the world; The licensed edition of More Indonesia is the 20th such agreement for its brands including Better Homes and Gardens in Australia, China and India, and Parents in China, Greece, Indonesia and Turkey. Worldcolor, the former Quebecor World, one of Canada's largest magazine printers, has announced that it is closing its Richmond Hill printing plant and consolidating all magazine, catalogue, direct mail and production and sales operations to its Aurora plant. The move will be completed by the end of March and will result in a net loss of approximately 150 jobs. With his extensive cabinet shuffle this afternoon, Ontario premier Dalton McGuinty has appointed the 7th culture minister in less than a decade, bouncing incumbent Aileen Carroll, who held responsibilities for the province's culture portfolio for a little over two years. Like his predecessor, Chan is taking on the job without any apparent qualifications for it or interest in its clients -- a suggestion that culture is an identikit portfolio. Nothing in his bio indicates much feeling for the nuances or dynamics of cultural industries, most of which are centred in Ontario. He is an insurance broker and stalwart of various Chinese professional and service organizations in his riding. Ian Brown has won Canada's richest non-fiction book prize for The Boy in the Moon: A Father’s Search for His Disabled Son. It is Brown's account of the struggle he and his wife Johanna Schneller have waged to deal with their son Walker's rare genetic syndrome. British Columbia’s National Award for Canadian Non-Fiction,presented by the British Columbia Achievement Foundation, is now in its 6th year and provides a $40,000 award for the winner. Brown is well known not only as a Globe and Mail feature writer and a TVO host but also as a frequent National Magazine Awards winner (he has won 7 gold and 5 silver medals and has been a finalist 27 times). Another finalist was Maclean's publisher and editor-in-chief Kenneth Whyte for The Sensational Rise of William Randolph Hearst. (Brown and Whyte's books are also shortlisted for next month's Charles Taylor Prize for non-fiction. )The other authors considered were Karen Connelly for Burmese Lessons: A Love Story and Eric Siblin for The Cello Suites: J.S. Bach, Pablo Casals, and the Search for a Baroque Masterpiece. The jurors were were Andreas Schroeder, Vicki Gabereau and Philip Marchand. Renew Canada is hiring an associate publisher. See the job board in the sidebar. Very sorry to learn that poet P.K. Page, a National Magazine Award winner and the grand dame of Canadian poetry, has died at the age of 93, in Victoria. As CBC News reports said, Page was considered one of Canada's most esteemed writers and a champion of small-scale publishing. Page was born in England and moved to Red Deer, Alberta in 1919, moving frequently with her father, who was a soldier. She began publishing poetry in periodicals starting in the late1930s and was frequently published in the Montreal journal Preview. She later worked as a scriptwriter for the National Film Board, where she met and married Arthur Irwin, who was the editor of Maclean's before becoming commissioner of the NFB in 1950. 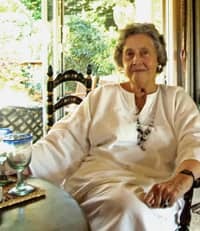 The couple settled in Victoria in the mid-60s after her husband's retirement and she began a long association with the Malahat Review, which is based at the University of Victoria. Her financial generosity allowed the magazine to create the P.K. Page Founders Award for Poetry which, every spring, awards a $1,000 prize to the author of the best poem published by the Malahat in the previous year. Her most recent books of poetry included Hologram (1994), The Hidden Room: Collected Poems (1998), Hand Luggage (2006), The Filled Pen: Selected Non-fiction of P. K. Page (2006), and Up on the Roof (short fiction, 2007). A tally of many of her long list of works. The common perception is that readers have abandoned newspapers and magazines. That perception is mostly wrong. More and more readers are viewing the content produced by magazines and newspapers, whether that's on paper or through another medium. Advertisers are the real culprit in the crumbling media equation. They've been abandoning magazines like a herd of frightened buffalo. Magazines and their websites drive consumers to search and to the web more than any other media channel. Magazines and online together multiply and increase all-important purchase intent metrics. Magazines are the primary driver of online purchase, more than any other medium. Magazines dramatically strengthen enjoyment of the media mix experience; magazine ads are seen as a service, not an interruption. Magazines noticeably add more helpful brand ideas and details to online communications. Magazines and their websites add needed trust to other online communications. Magazines strengthen online's connection and engagement with the consumer. 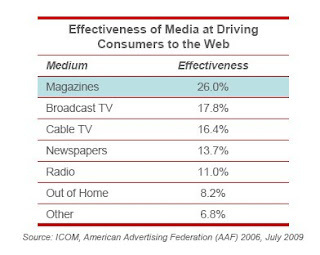 Magazines and online together significantly improve consumer attention and relevance to advertising messages. Magazines and online together deliver all age and key upscale income demographics, broadening magazine and web footprints. Magazines and online together deliver against virtually every mass or vertical audience. There was a time (or was there?) when magazines expected to generate reader loyalty by the quality of their content.That, apparently,is not enough. According to a story in Folio:, the U.S. division of Hachette Filipacchi is considering following the lead of its UK counterpart in developing "reader loyalty clubs" to increase audiences and revenue. Subscribers would be rewarded with access to film tickets, discounted products and preferred access. This is already done in Canada by such publishers as the Globe and Mail which offers front of the line access to shows and performances. Many such arrangements are done in collaboration with retailers, promoters and manufacturers and it is hard to see how this won't further blur the line between content and promotion. Where once mainstream magazines were in the business of renting reader access to advertisers, now the necessity in the minds of some big brains in the business is to sell products and differentiate between readers who buy the deal and those who buy the stories. (Of course it was similar big brains who thought it was a good idea to move Jay Leno to 10 p.m.). I'd be interested to hear about this (can I call it a trend?) from magazine people who like the idea and perhaps already do something similar, and (of course) from those who don't like it. Click on the word "comments" below. A new online magazine called YongeStreet has been launched in Toronto by a Detroit-based service provider. The new site, which will be published every Wednesday and e-mailed to a list of subscribers, will be staffed by freelancers who are also staffers on other Toronto-based print and online magazines. Shawn Micallef, a regular blogger senior editor of Spacing and public-space columnist for Eye Weekly will be managing editor on behalf of site owners Issue Media Group. Other YongeStreet staffers include development editor Bert Archer who also writes for the real estate section of Toronto Life, and managing photographer Tanja Tiziana, who runs the photoblog Doublecrossed.ca. Innovation and job news editor Edward Keenan also works as senior editor of Eye Weekly.